Let's face it, who wouldn't love the thought of a slot machine that features piglets, chickens and horses? The Barnyard Bonanza slot game has all the farmyard fun you could ever imagine. And more. Produced by Ainsworth Gaming, it's a game that has become really popular in casinos found all over the world. Our free version of Barnyard Bonanza is easy to play - just wait for the game to load and you can start playing, no download needed and no registration required. 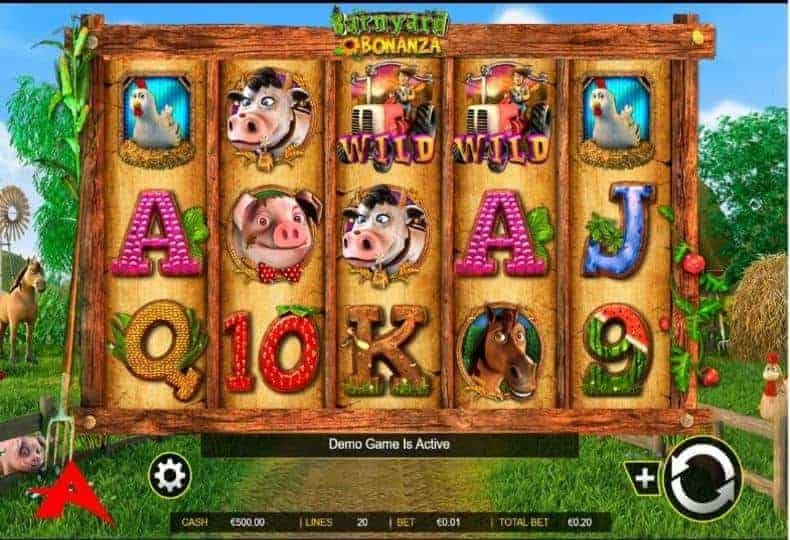 Barnyard Bonanza is a 5-reel 20-pay-line slot machine coming from the Ainsworth Gaming creative kitchen. Sporting cartoon-like graphics and animations, the game revolves about farm life with animal symbols including cows, horses and pigs along with scarecrows and barns paying high-value awards. Of course, there is much more this game than just the characters on the symbols, it's a very good game in it's own right. The way the game is produced, the way the reels come in, the little sounds and the attention to detail make for a great game. Playing this slot machine, you soon realise that it is all about the free spins and there are five different free spins features in total. They are triggered by 3 or more Chicken Scatters while Farmer Wild appears on all the reels throughout the game to complete your winning combinations by replacing all regular symbols. The 5 different free spin game you can trigger, are the Barn, Scarecrow, Pig, Horse or Cow free games with respective symbols appearing in stacks. Depending on the triggered feature, you can win between 10 and 14 free spins during which the Golden Egg appears on the reels to reveal a mystery bonus prize going up to 5x your total bet and 1, 2 or 3 additional free games. The great thing here is you get to choose the wild symbols in the free spins and with that, the actual number of free spins you get in the bonus. It's really cool. The maximum payout you can win in a single spin is 2,500 coins with Farmer Wild being the top paying symbol and awarding 125 coins for a five of a kind winning combo. If 5 Scatters hit the reels, you will win 50x your total bet. New Zealand and Australian punters can enjoy Barnyard Bonanza pokie too with all the bonus features including five different free spins rounds available. UK players, who commonly call this type of casino games fruit machines or slots, can play it too and enjoy all the benefits it comes with.